If you have ever wondered how to plan a tour for your band, then you need this ebook. I will show you how to book, manage and profit from your next tour. 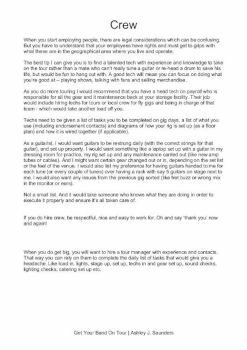 We will cover the different options you have, how to find and book venues, how to budget and work out all the costs involved with touring. We will spend some time talking marketing and publicity - both are essential for getting tickets sold. And I will explain how to source and sell merchandise profitably. You may have never toured before, bar the odd few gigs in the back of a van. or you might have been on the road before but are looking to plan your first tour. 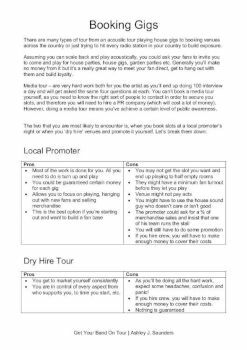 Whether you're a touring pro or virgin, this eBook will show you how to plan a tour for your band and give you a roadmap for scaling touring from your first. 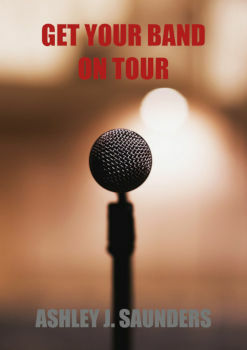 In Get Your Band On Tour eBook, we will discuss how to find and book venues, and the many routes you can take to do this. Also, we will talk about how to piece dates together in a logical order in order for you to minimise the time you spend on the road travelling and maximise your fuel budget. We will talk through all of the costs involved with touring. And how to draw up a simple cash flow forecast to ensure that the tour will be profitable before you leave home. You will learn about the correct way to market and publicise your tour. Both are critical for getting tickets sold and ensuring you can keep making enough money to stay on tour. Finally, I will explain how to source and sell merchandise profitably. Merch is the hidden secret to tour profitability and if you do it correctly could mean your tour makes money rather than losing money. 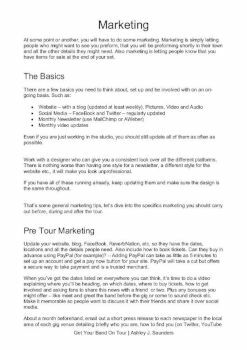 If you're in a band but are struggling to put a tour together or even where to start, then this is the eBook for you!